To purchase these fine items please contact the Artists via the contact info below, or at the Artists Page. 10% of sales benefit Past and Present Media to promote local artists. $7.00 each/ Five for $25.00. 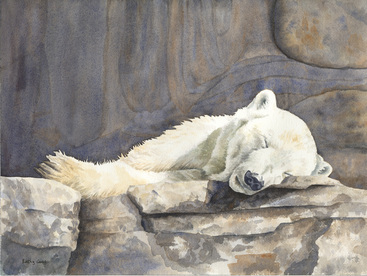 Kathy Goss- "Polar Bear" 12" x 16" Watercolor on Arches 190lb paper. Tim Thornton- "Western Star" Medium: Rust on #20 gauge steel sheet, interference pigment, polymer. 27" x 39"
​Kathy Goss- Unique, handmade earrings using Lightfast Watercolor on 140lb watercolor paper, glazed, and finished with freshwater pearl and sterling silver ear wires. Very lightweight and durable. ​ James Cagney- "Dirty Thuderstorm" collection of Poems.